They say that Alice In Wonderland is just a book about drugs. All the way through it. On this anniversary of the release of the book I went hunting for something that describes what drugs who was on at what time. You could say that a lot of the thinking about the drug references only came into popular culture in the drug addled days of the late 60s. You would be correct. Especially with songs like Jefferson Airplane’s classic late 60s song, White Rabbit. Before you start, I know that some of the drugs weren’t around in 1865 but that’s not stopped the people who believe the story that it was all about drugs and not a concussion that made Alice believe what was happening. 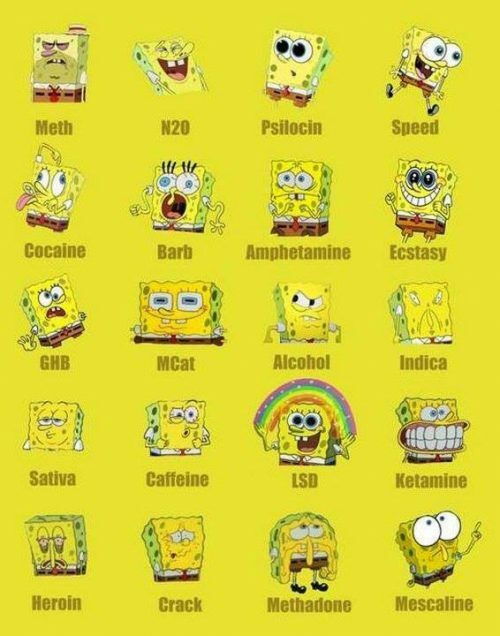 It’s not only Alice that has had the drug treatment, I did discover on trawling randomly around the web a similar one about SpongeBob Squarepants. I’m not sure what the best one is but LSD runs quite high. You can always comment about what you think is the best in the box below.